remarkable for his learning, political writings, and in some ingenious and witty pieces in the poetical way…a sincere friend, an agreeable companion. There is evidence Arbuckle was childhood friends with John Smith and Thomas Drennan. He studied in the University of Glasgow, obtaining an MA in 1720, and studying for the ministry up to 1724. He was a poet, publishing a number of works including Snuff (1717), Epistle to the Right Hon. Thomas Earl of Hadington, on the Death of Joseph Addison, Esq. (1719) and, on the beauties of the Clyde, Glotta (1721). A 1719 letter in verse from poet Allan Ramsey to Arbuckle survives (see The Poems of Allan Ramsey, Vol.2, p. 375), as do verses addressed to Ramsey by “James Arbuckle” (The Poems of Allan Ramsey, Vol.1, p. clxxiii). While at Glasgow he acted as an intermediary between the students, who wanted to restore their right to elect the rector, and the Viscount Molesworth, who lent his support to the students. He also may have assisted John Smith in writing A Short Account of the Late Treatment of the Students of the University of G[lasgo]w (1722), published in Dublin to drum up support for the Glasgow students. In 1722 Arbuckle was also involved in a Glasgow dispute over non-Subscribing ministers in Belfast, defending them from “allegations…derogatory to the Reverend Ministers” in representations made to the Synod of Ayr and Glasgow by Samuel Smith. When he left the university and moved back to Dublin, Molesworth offered him patronage. Arbuckle became part of the Molesworth Circle, along with other graduates of the University of Glasgow, including Francis Hutcheson. Probably with the encouragement of Molesworth, Arbuckle established the Dublin Weekly Journal, which he edited and wrote for from 3 April 1725 – 25 March 1727. (A digitised image of a copy of the paper dated 26th June 1725 is here.) Arbuckle and Hutcheson’s contributions to that journal were included in the collected essays, articles and poems called Collection of letters and essays on several subjects, later republished (1732) as Hibernicus’ Letters. It was dedicated to Robert Molesworth’s son and printed by two others associated with the circle around Molesworth, his friend John Smith, and William Bruce. It is certainly much more laudable to inspire Men with noble and generous Sentiments, to reform a vicious taste, and cure them of their Follies and Prejudices; that it is to fill their Heads with a Set of Notions that are of little other Use, than to be evaporated in a Coffee-house. [Virtue] is nothing but the beauty of a life founded in uncorrupted social and benevolent affections. Beauty, inward and outward, in the source of happiness, which takes three forms: pleasure, joy and tranquillity. Pleasure and joy are delight in the beauty of inanimate and living things respectively; tranquillity is the state achieved by those who live virtuous lives. Arbuckle is optimistic about human nature and the human condition, and like Hutcheson wrote against Mandeville on those topics. The Dublin Weekly Journal folded in 1727. Arbuckle then wrote a series of essays under the title The Tribune in 1729. The majority of the contributions deal with the chronic economic problems in Ireland, which Arbuckle argued could be fought by reducing the level of absenteeism among landlords and encouraging cooperation between Ireland and England rather than the existing destructive competition based on patriotism. Arbuckle’s last essay for The Tribune was a satire on the philosophy of George Berkeley. Swift (or his supporters) were hardly innocent in the row, writing “Wit upon crutches, or, the biter bitten. : Most humbly dedicated to the ingenious Mr. Arbuckle author of the Dublin Weekly Journal” as early as 1725, in which Arbuckle’s disability was not spared from mockery. Ultimately counterattacks by Swift and his supporters meant Arbuckle came out worst from this literary row. However the printer Faulkner claims Swift and Arbuckle were acquaintances over many years. A letter to Thomas Drennan from Arbuckle in the late 1730s mentions Swift praising an article (which has not survived) by Arbuckle in Faulkner’s journal and announcing an intention to call on him. 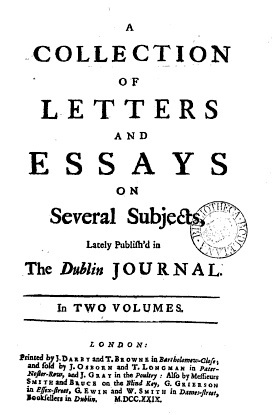 The major surviving work by Arbuckle from this time period is A Poem Inscribed to the Dublin Society (1737), which concentrates on the economic themes dealt with in The Tribune. Arbuckle seems to have retained his contacts with the Molesworth family. By the 1730s he was a clerk in the Irish revenue service and living in Crow St, Dublin. He died on 16th January 1742. The lack of information about his life was compounded by misattribution of his work, and confusion between him and Dr James Arbuckle who lived in Dublin at the same time and was Francis Hutcheson’s brother-in-law. for details of James Arbuckle’s father. M. A. Stewart (2004) “Arbuckle, James” in The Dictionary of Irish Philosophers, Thomas Duddy (ed), pp 6-8. Both quotations are taken from this entry. Mentions Arbuckle and other ex University graduates involved with the Molesworth Circle. Discusses the nature of debate in the Enlightenment, which was frequently far from polite. Quotes Arbuckle’s verse on Swift and some replies.